It has been a crazy spring but we are finally starting to get caught up on the field work. The beans went in fast and were all up with in five days of planting. 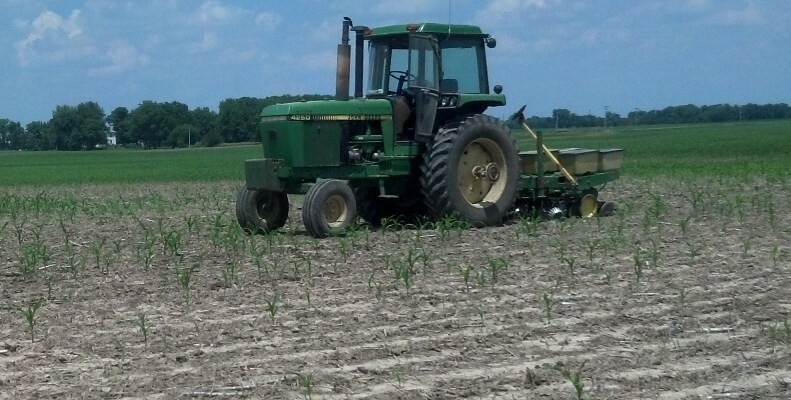 We ended up replanting 105 acres of corn including a whole farm and several patches. Most of the corn sidedressing is complete with only a couple hundred acres of late planted corn to go as soon as it gets some size to it. We only have received 1.1 inches of rain for the month so far, but there is a storm on the horizon. Later this week we will start post spraying some bean herbicide. Until then we we will be cleaning up equipment, mowing, and getting caught up in the office. Great Weather…..If you are a duck! We have now received a total 11.5 inches of rain since April 1st. So far it looks as if we may not have to replant any corn, but today we are going to start rotary hoeing what was planted on the 24th and 25th. The combination of cool soil temperatures and the drying out of the soil surface over the last two days has caused that corn some trouble. Everything else that is up is looking good with stands much improved over what we saw last year. When it dries out we will be busier than ever. We have one big day of corn planting left, corn that is ready to sidedress, a couple days of spraying bean burn down, all the beans to plant, and much of the corn to spray post.